1 of 4 In a bowl, combine meat, parsley, garlic, Worcestershire, Tabasco and oregano. Season with salt and pepper to taste. Form patties 4 to 5 inches across and 1 inch thick. 2 of 4 Heat a grill to its highest setting. Brush, clean and rub grill grate with an oiled towel before starting; this will prevent meat from sticking. 3 of 4 Brush burgers with a tiny bit of olive oil and place on hottest part of grill. Grill until burgers are nicely browned, about 4 minutes per side for medium. When burgers are almost done on second side, top with Gorgonzola. Split rolls and place on grill to be toasted. Close lid and cook burgers until cheese is melted (check often so buns do not burn; they should only take about 30 seconds). 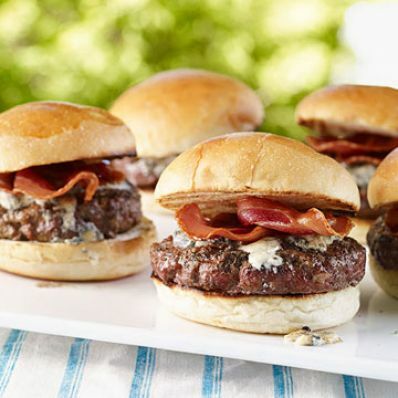 4 of 4 Remove buns, place on a platter, add a burger to each and top with crispy pancetta.